Large LCD display, display of channel, unit, trend and measured value (4 digits). Selection of the channel to be displayed and the units via keys. The principle is simple: the USB interface is connected to the PC. The connection to the automation equipment is via standard SysLink connectors. Input and output signals can thus be read into and output from a PC. So that EasyPort can adapt to different situations, we have developed software for the device drivers with a graphical user interface, via which connections can be made. 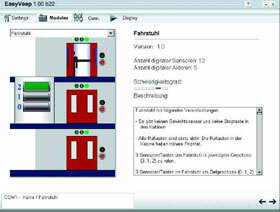 With EasyPort and the simulation software EasyVeep, which is included in the standard delivery, a variety of process models which are similar to real applications can be controlled with any type of PLC. The models are documented and meet a broad range of requirements.